So, from what I can tell, this winter is going to be a chilly one. Which means you’ll be speeding a whole lot of time inside. But, if you like me you’ll grow bored really fast from cabin fever. I must say the holiday season is when I’m my most creative. I don’t know if it’s the combination of the “joy in the air” or the fact that I have so much free time inside. Either way, I’m constantly in a creative mode. 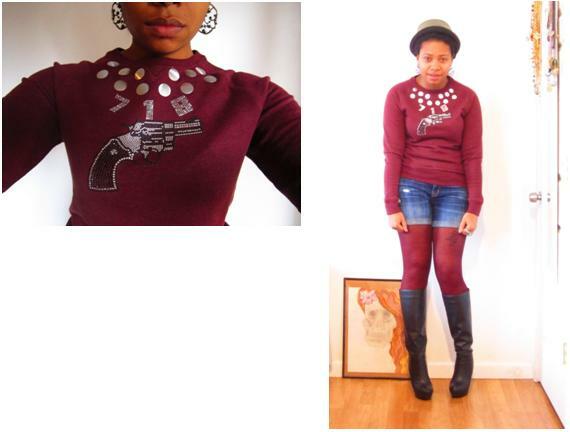 So I decided to pick 3 basic items (I went for wine colors and cozy textures) and embellished them to make them my own. Here, I will show you how to do the same to your pieces! For one, if you’re not a pro at this or have not taken at least on craft course, I would not suggest either using one of you favorite items or spending a lot of money on a new one. Leave room for possible era so there will be less regret if it didn't come out as expected. The first item is a pair lounge sweater pants from the Gap. I wanted a pair of lounge pants comfy enough for the house, but if I need to go run errands or had to go to a quick brunch for breakfast I wouldn't feel like the ultimate couch potato. So, for these I use 2 different styles, colors and sizes of iron-on studs. 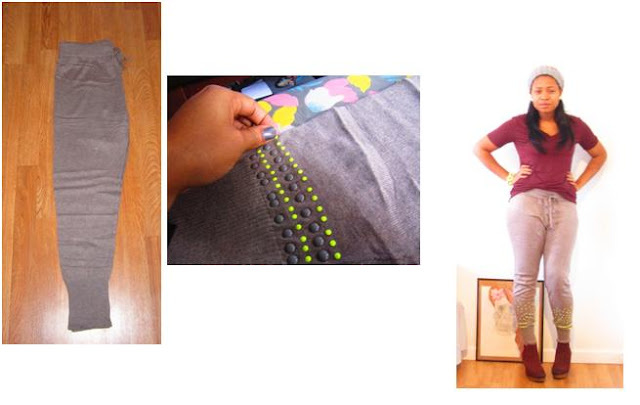 Iron on studs are the easiest to apply and the quickest to wear out after application. I placed each stud by hand to create the desired effect and design. I then place a cotton cloth over them and apply heat from an iron. Just be mindful of the heat setting and the fiber of the garment so you don’t burn it. I let it cool and then turn the pants inside out to iron the back to secure the glue from the stud. Let it cool for about five minutes and viola! The next item, a mens sweatshirt from Forever21 pretty much goes on the same concept of iron-on embellishing. 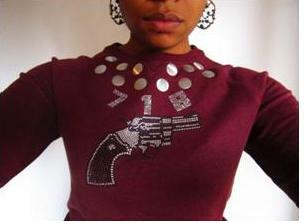 Not only can you find iron on studs, but stud designs and appliques. Its cuts out some of the work of you having to tediously stud for stud make a shape yourself. I first, following the same steps from the pants place the large silver studs where I wanted them on the sweatshirt. I then peel the number appliques off their protective backing and place them where I wan them to go. The cool thing about the appliques are the studs are stuck to adhesive clear sheet that will stick to the garment keep the shape in place. Once you have them exactly where you want them, turn the sweatshirt inside out (the applique wont bugde) and iron. Let it sit and cool for about two minutes and then peel off the sticky paper. You’re done! Now, the third and final piece, which is my favorite is a basic shift dress from Forever 21. Great color, great fit. Not too much excitement other wise. So I decide to create a floating necklace where the necklace is automatically attached to the dress. 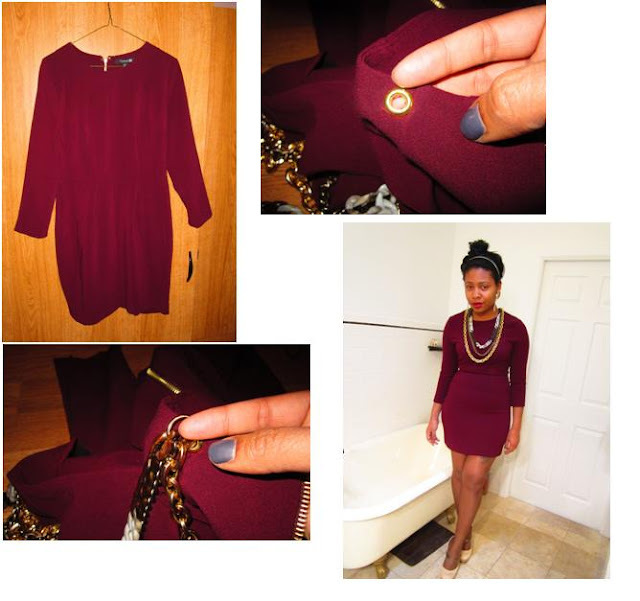 First, evenly measure 2 spots on the top back of the dress you would want the necklace to hang from. I've seen a lot of garments where the “necklace” is attached on the front. But how many necklaces connect in the front of your chest. After that, use a fabric hole puncher and make holes. Go to your local trimming store to get garment grommets. Follow the instructions on how to apply. Next, add on a jump ring. Depending on the weight of your chain(s) make sure the jump ring can support it. Now, cut and layer your chains onto the rings. Close the ring and you dress is complete! All of this is relatively easy to do. You can check out M&J Trimmings on 6th ave and 38th Street in NYC or just Google a trimming store near you or online. And most importantly be safe and have fun!